Great! 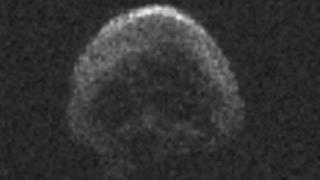 Yet another object we can worry about not seeing before it hits us. Long past time to step up our monitoring of these threats, especially in the Southern Hemisphere. —Where be your gibes now? Your gambols? Your songs? Your flashes of merriment that were wont to set the table on a roar? Not one now to mock your own grinning? Quite chapfallen? Oooh. The photo does look like the top part of a skull. I wonder who might have hurled it at us.